When the iMessage App Store first launched, it was touted as the next big platform for apps — a new way for developers to gain users and make money, and was followed by an initial surge of iMessage app downloads. Now, however, the excitement is fading as is the app store’s growth. During the first few months after its debut, the iMessage App Store was seeing growth of over 100 percent month-over-month. Between January and February of this year, that’s dropped down to just 9 percent. According to a new report from app intelligence firm Sensor Tower, there are nearly 5,000 Message-enabled apps — the same number of iOS apps released in year one of the App Store. That should be a promising figure, given how much the iOS App Store has grown over time – it has 2.2 million apps as of January, 2017, Apple said. 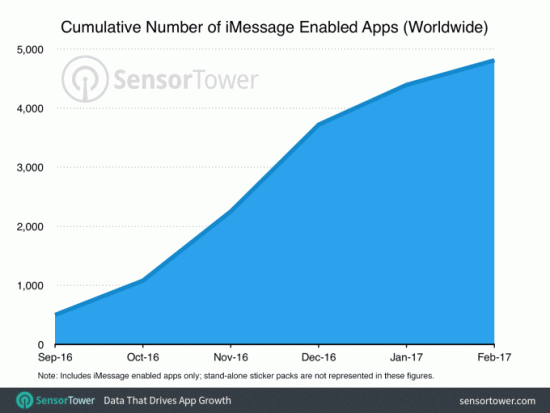 From its launch in September, 2016 and the end of October, Sensor Tower says the number of iMessage-enabled apps had grown approximately 116 percent to nearly 1,100. By November, that figure had grown another 108 percent to around 2,250 apps. But by December — notably a month when developers rush to be ready for the numerous users unwrapping new iPhones and installing apps — growth slowed to 65 percent, bringing the store to 3,700 iMessage apps. Games continue to be the most popular iMessage app category, ahead of entertainment, utilities, social networking, and photo & video apps. However, even within these categories, many of the apps are stickers — like those that use the existing IP from a popular gaming franchise, for example. Of course, it should be expected that growth will taper off to some extent after a new platform’s launch, as this is the time when developers push out their new apps in order to be ready for the new users. 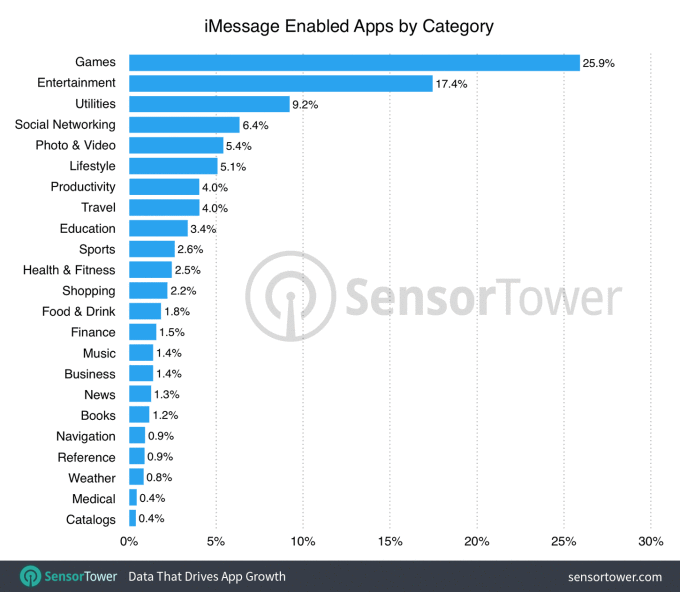 However, to see growth so close to leveling off this early into the iMessage App Store’s existence should be concerning for Apple and its developer community — it suggests that users have not yet embraced apps on iMessage in large numbers. I myself am something of an app addict, but find iMessage apps cumbersome to use because of the user interface. Many users may still not even realize there’s an app store tucked away under their keyboard, in fact, because of the way the integration has been designed. As it stands now, it’s a lot of work to get to the sticker you want — you tap the arrow next to your iMessage text box to find the “app store” button, which takes you to the last app you used. You then have to tap the four-dot button on the bottom left to return to your list of apps, then swipe through the pages until you find the app for the stickers you want to text to your friend. By comparison, look at how Facebook Messenger does things — or any other messaging app for that matter. Stickers are only one tap away. If Apple truly wants iMessage to become one of the top messaging platforms — it needs to think about what already works in the larger messaging app market, and make the necessary adjustments. With any luck, we’ll see this problem addressed in the next big iOS release. Sensor Tower has now run the number for March, and found that the month is on track to match February. That means the store’s growth is not slowing further between February and March. However, it doesn’t paint a picture of a store that’s growing much, either.